When mentioning the best quarterbacks in Iowa State history, David Archer’s name will certainly appear at the top of the list. Archer broke virtually every school passing record during his short two-year stint in Ames from 1982-83. His name is still etched on most of ISU’s passing top-10 record lists. His outstanding career at Iowa State was just a stepping stone to bigger and better accomplishments professionally, however. Archer became a starting quarterback in the NFL, one of just four Cyclone signal-callers to start a game in the NFL, a league MVP (WLAF) and a record-setting passer (CFL). Now at the age of 53, Archer has settled into another career as a radio analyst, where he will begin his 13th season as the color man for the Atlanta Falcons radio broadcasts. I had the chance to catch up with the Iowa State Hall-of-Famer recently. I hope you enjoy this Q&A. How did you choose Iowa State? DA: My Dad was born and raised in Arkansas and I always envisioned myself playing for the Razorbacks. We looked at that option coming out of high school, but I had a make-good scenario where they couldn’t commit to giving me a scholarship, so I decided to go to junior college (Snow Community College in Utah) instead. Coming out of junior college I was heavily recruited by Iowa State, LSU, Texas, New Mexico and UTEP. Those were the five schools that really came after me hard. Ironically, Mack Brown, who was the offensive coordinator for Donnie Duncan at Iowa State, had just left ISU and went to LSU. He recruited me at both places. Ultimately, the decision was pretty easy because both LSU and Texas wanted to redshirt me. Iowa State had no plans to redshirt me. In fact, they wanted me to compete with the quarterback returning (Jon English) who had backed up John Quinn. So I came in and rolled the dice and tried to beat this kid out. Archer ended up earning the starting job at Iowa State where he passed for 1,465 yards with 125 completions during the 1982 season. 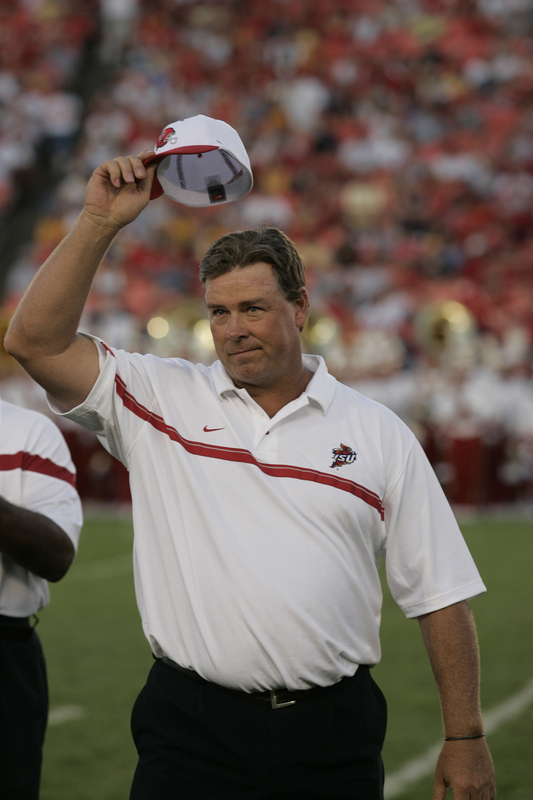 It was the final year of the Donnie Duncan era, and the Cyclones were primarily a running team. Running backs Tommy Davis, Harold Brown and Jason Jacobs carried most of the offensive load for the Cyclones, combining for 1,937 yards on the ground. The transition from junior college to big-time college football was difficult in Archer’s first year at Iowa State. What was it like in your first season at Iowa State under Donnie Duncan? DA: I was playing D-I football against some of the best teams in the nation. I was more concerned about me coming in and winning the job than I was what we were going to do offensively. I had thrown the ball a ton my sophomore year in junior college. We were one of the top passing junior college teams in the country. It was a change for me. We played out of an I-formation, option style attack. As I got more accustomed to the offense, we opened it up a little and they let me throw it a little more. Obviously, there was a learning curve for me. I struggled some, but it benefited me for the next year. Would you consider the 19-7 win at Iowa the highlight of your first season? DA: No question. It was a great win in my career. Obviously, coming in as a college football fan, I understood rivalries. I didn’t understand the specifics of Iowa State-Iowa, but I understood what a rivalry meant. It was cool in my mind to have one of those kind of rivalries. It didn’t take me long in the spring to find out what the game meant. So when we lined up against the Hawkeyes in the game in 1982, I understood what it meant. 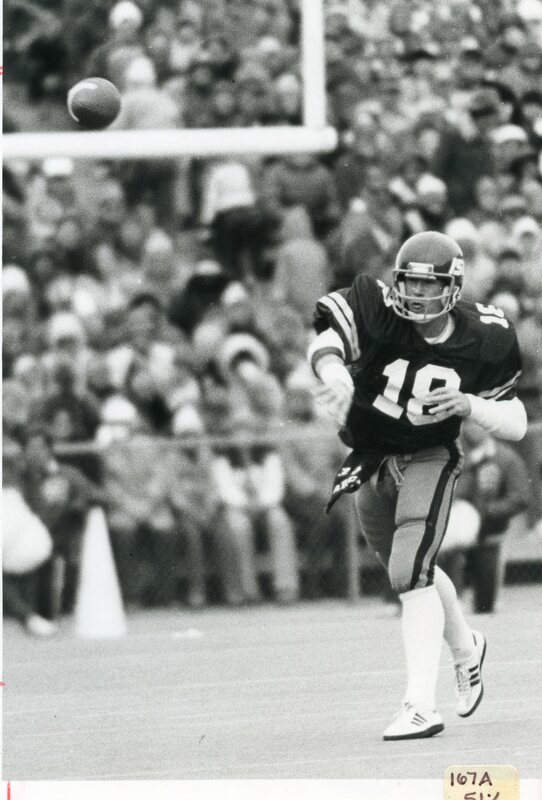 David Archer set Iowa State single-season records in passing yards (2,639), completions (234) and TD passes (18) in 1983. The football program was shocked when Duncan announced his resignation following the 1982 season. The administration picked former Boise State head coach Jim Criner to lead the program in Archer’s senior year in 1983. Criner and his offensive coordinator Gene Dahlquist opened up the playbook and Archer thrived. Riding the arm of Archer, the Cyclones were second in the Big Eight in passing offense (247.0) and Archer was its top passer, leading the Big Eight and ranking eighth nationally in total offense at 245.3 yards per game. Archer set Iowa State season records in passing yards (2,639-now 5th), completions (234- now 4th) and TD passes (18- now T3rd). It was definitely a breakout season for Archer. How was the transition to Criner from Duncan? DA: It was easy for me to make the transition when Coach Criner got there. Gene Dahlquist was our offensive coordinator and he was a great coach. Gene and I remain really close. I learned a lot about coverage and a lot of stuff that helped me transition to the next level. I had a young receiving corps. The top three receivers were freshmen and sophomores. Without a doubt, Archer benefitted from the emergence of sophomore wide receiver Tracy Henderson during the 1983 campaign. Henderson posted the greatest season ever by a Cyclone wideout, setting school records in receptions (81) and receiving yards (1,051). Henderson’s 81 catches ranked third nationally and is still a Cyclone school mark. He earned All-America honors that year and the chemistry he forged with Archer played a big part. What was it like having an All-American receiver like Tracy Henderson to pass to? DA: Obviously, Tracy and I hit it off and I tried to get it to him as much as I could. He had a great feel for the game. He wasn’t extremely fast, but he was quick in short spaces. He changed direction really well. He had great feel of playing off of people and playing basketball in the short routes. He had a nice feel for dead areas and zones. We had a couple of routes designed where we had two outside receivers and Tracy would slide inside and play the slot, which is essentially what you see now in a Wes Welker-type position. That position is glorified now in the NFL and Tracy was doing it in 1983, and he was really good at it. He would get isolated on safeties and linebackers and they couldn’t match up and Tracy ate them alive. He also had good body language which I could read really well. I could anticipate some of the routes he was going to run. We just had a really nice mesh between us. One of the biggest wins in 1983 was the 38-35 come-from-behind victory over Kansas. You passed for 300 yards that day. What do you remember from that game? DA: Kansas had just beaten a nationally-ranked USC team. They had a good team and it was a passing day for both teams. We were down 14 points in the fourth quarter and were able to storm back and score and then got the ball late. There were a lot of plays made by a lot of people, but what I remember most was our tight end Brett Blaney making a huge play. It was 4th-and-3 and we weren’t quite in field goal range and we had to go for it. Blaney runs a little arrow route to the left side, and as I throw the ball, it gets tipped at the line of scrimmage. Blaney then leans back and makes a left-handed, one-handed stab to catch the ball and extend the drive. We then later get in field goal range and Marc Bachrodt hits the field goal to win the game. My Dad was at the game. There was a picture in the Iowa State Daily of me and my Dad hugging on the field. I still have that paper. It was a great moment. You guys put up 29 points and you threw for 346 yards against one of the greatest Nebraska teams of all-time in 1983. What are your memories from that game? DA: They (Nebraska) had such intelligent fans. They understand when they see a pretty good performance by the opposition. We came in and they couldn’t stop us. They tried to play cover two and man coverage underneath and we were eating them alive. We couldn’t stop them, though. They were just so good on offense. Their defense was good. Coming into the game it was talked about our offense, which was ranked No. 2 in the Big Eight, going against the Big Eight’s top defense. They said they were going to shut us out. We went in with something to prove. As it turned out, it was the most points they gave up all season until Miami beat them in the Orange Bowl. As we left the field and went through the tunnel, the Nebraska fans there clapped as we left the field. I thought that was pretty cool they payed tribute to us because they realized we had given their defense all they wanted. After graduating from Iowa State, Archer went undrafted in 1984. Undeterred, he signed a free agent contract with the Atlanta Falcons and made the roster as its third-string quarterback in 1984. 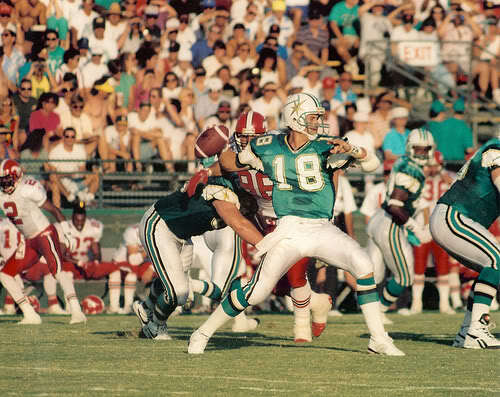 The following season, long-time Falcon signal-caller Steve Bartkowski went down with an injury in the fifth game of the season and Archer was suddenly thrusted into the starting slot for the final 11 games of the year, finishing the 1985 campaign with 1,992 passing yards. 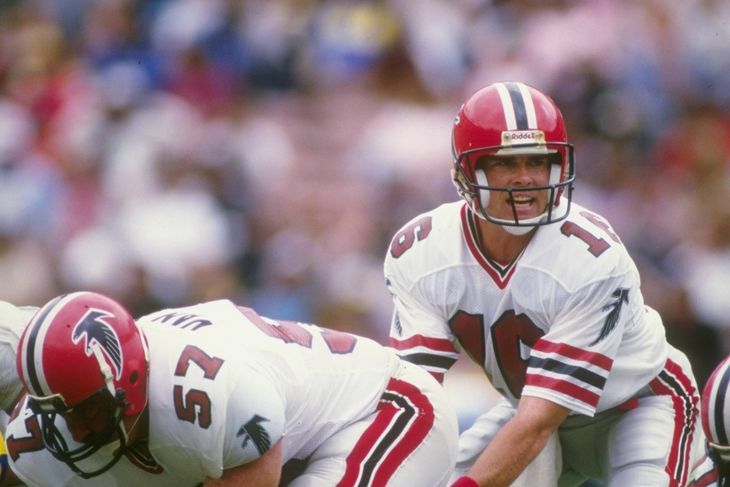 The experience gave Archer confidence and he was named the starting quarterback for Atlanta heading into the 1986 season. Archer led the Falcons to a 5-1-1 record to open the season, raising eyebrows across the NFL. He was named NFC Player of the Month for September. What are your memories of the fast start to the 1986 season? DA: I was 24 years old and the youngest starting quarterback in the league at the time. Bernie Kosar (Cleveland Browns) and I were the two youngest starting QBs at the time. I had a lot confidence and had a lot of fun. Unfortunately, we were not a very deep team and by midseason we all kind of got hurt. I separated my shoulder in week 10 and was out for the rest of the year. Prior to the 2012 season when Matt Ryan led the Falcons to a 9-0 start, our 4-0 start was the best start in Falcons history. It was a neat moment to be a part of that and be a part of that team. One of the biggest games of the 1986 season was the win at Dallas in week three. You threw for 269 yards and rushed for 41 yards in a huge fourth-quarter comeback. What were some of your memories of that game? DA: The Falcons had never beaten Dallas in Dallas. I had a really good game and we won 37-35. We were down 35-27 with about four minutes left in the game. Gerald Riggs scored a touchdown to cut it to 35-34. We got the ball back and I connected with a guy with about 30 seconds left on a deep route to set up the game-winning field goal. It was a special moment. David Archer started 23 games at quarterback in his NFL career. Archer’s 1986 season was cut short when he separated his shoulder. He lost the starting job in 1987 and bounced around the league for the next four seasons as a backup for the Washington Redskins, San Diego Chargers and Philadelphia Eagles. Archer was only 30 years old and he still felt he could play. A new league called the World League of American Football (WLAF) had recently been formed and Archer wanted to show he could still run an offense, so he jumped over to play for the WLAF’s Sacramento Surge for the 1992 season. Archer was outstanding, leading the Surge to the World Bowl Championship. He was named MVP of the league and MVP of the World Bowl. How special was it to win a championship in the WLAF? DA: I enjoyed playing in the WLAF. I kind of got locked into a back-up situation in the NFL, but I knew I could still play. I needed to do something to jar people’s memories to show I could still play. At the end of the 1991 season I was offered a chance to play in the new World League. I took the opportunity and we won it all. I got the chance to play with former Iowa State receiver Eddie Brown. We teamed up and kind of had the Tracy Henderson-Dave Archer thing that year. We really meshed well together. It was fun to win a championship. Archer remained in Sacramento for the 1993 season, but with a different team and a different league. The Canadian Football League (CFL) branched out to the United States and the Sacramento Gold Miners were the first U.S. city to host a CFL franchise. What Archer did in his first season in the CFL was unprecedented. He threw for 6,023 yards, becoming one of just four players in professional football history to record over 6,000 yards passing in a single season. He ended up playing five seasons in the CFL, recording 20,671 yards passing and 120 touchdowns before retiring after the 1998 season. How much fun did you have playing in the CFL? DA: It was fun slinging it all over the yard. We were the first American team to play in Canada. The CFL had expanded into the U.S. and I played for Sacramento. The nuances of the game were kind of lost on the American public. We were used to a more stationary game with one guy in motion. In the CFL, you would have a lot of guys approaching the line of scrimmage. We were kind of learning the game as we went. Plus, there was 12 guys on each side of the ball and the field was bigger. But we were slinging it all over the yard. I think I threw the ball over 700 times in 1993 (701). I had a lot of fun doing it and some good guys to play with. It was a fun game to play. I have done a number of interviews since my career has been over, and if we didn’t have the traditions you already know with American football, and if you were asked which type of football you would rather play, you would probably pick the Canadian game. It’s just so wide open and fun to play. 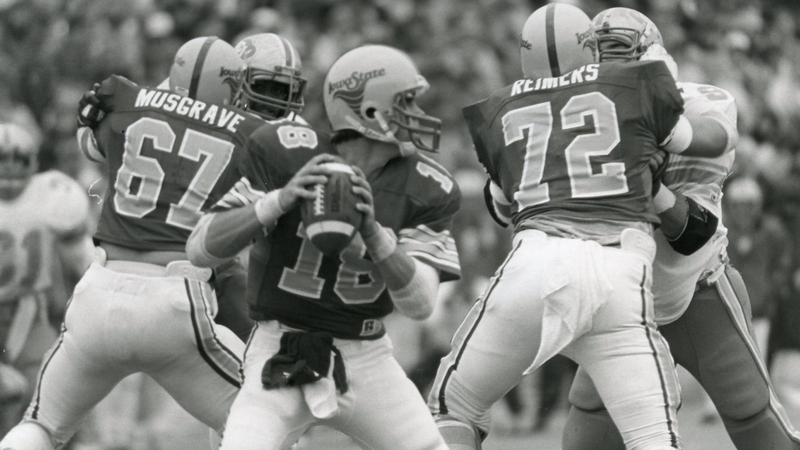 David Archer threw for 6,023 yards in 1993 for the CFL’s Sacramento Gold Miners. Archer always had an inkling he would enjoy broadcasting once his playing career was over. During one of the brief times he was out of work, he returned to Ames to catch a Cyclone game. He asked Pete Taylor and Eric Heft if he could tag along in the booth to see their side of the action. Taylor and Heft offered Archer a chance to fill in briefly, and he nailed it. It was an impetus to where he is at today as he enters his 13th season as the color analyst for the Atlanta Falcons broadcast team. How did you get interested in broadcasting? DA: Pete (Taylor) was a great friend of mine. It was a sad day when he passed. He called all of my games. Eric (Heft) has been a good friend as well. It’s something I always wanted to do. I figured I had to work at it. I knew the game pretty well. The important thing is to make appropriate comments and say things concisely where it fits into a broadcast. I worked at it. I listened to the broadcasters I really liked and took what I liked from them and tried to apply it to what I did. How honored are you to continue your affiliation with the Atlanta Falcons? DA: It’s been a lot of fun. When Mr. (Arthur) Blank (Atlanta Falcons owner) took over he showed that he really values what my partner Wes Durham and I do for the team. He’s been very kind. He listens to the game with our broadcast. He will not listen to the TV or the opposing broadcasts. He has to have our broadcast put in his headset. We have a satellite feed that gives him the games and that’s the only broadcast he will listen to. That’s pretty cool when you get the owner listening to you. 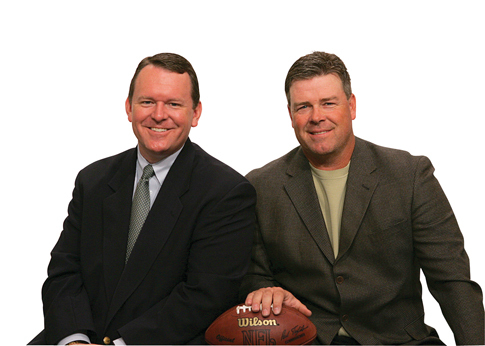 The Atlanta Falcons radio broadcast team: Wes Durham and David Archer. How special was it for you to be inducted into the Iowa State Hall of Fame in 2005? DA: It was a great day. It was neat that Dan McCarney asked me to speak to the team on the Friday before the game. It was a neat class. Fred Hoiberg, who I have gotten to know really well in the last couple of years, was in that class as well. It was neat to go in with Fred. Anytime you are recognized by a major institution like that, to be considered one of the elite to have had the chance to wear the colors, it’s an amazing feeling. My family was there and it will always be a day I will never forget. David Archer honored at halftime of the Illinois State game as a member of the 2005 Iowa State Hall of Fame class. Despite your busy schedule, do you still get a chance to follow the Cyclones? DA: I follow the Cyclones on Twitter. I follow Sam Richardson (QB) on Twitter. I tried to shoot out messages to the guys as best as I can. I get alerts on my phone via ESPN telling me how they are doing. Yeah, I’m very much a fan. I got my Iowa State shirt and my Iowa State golf bag whenever I’m on the course. I'm in my 24th year working in the Athletics Communications office at Iowa State and in my sixth year as Assistant Athletics Director for Communications. My passion has always been ISU Athletics and the seed was planted by my father, Ken, who was an All-Big Eight pitcher for Iowa State in 1960. I graduated from UNI in 1993, where I was a two-year letterwinner on the golf team, and received my master's at ISU in 1997. I've covered volleyball, wrestling, baseball, golf, football and men's basketball at ISU, including 13 seasons as the men's hoops contact. It's an honor to be the football contact for Coach Campbell and the Cyclones. I've got stories to tell, and I love telling them.